This entry was posted in Star Wars/Stormtrooper. Bookmark the permalink. 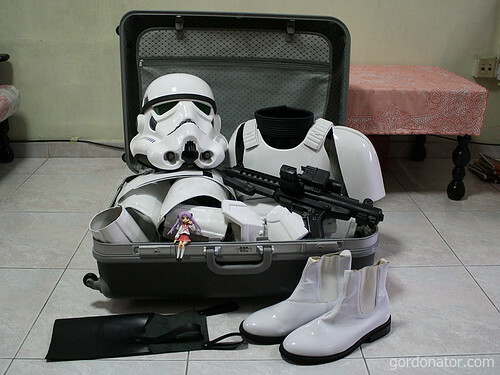 OOOooo I can forsee another stormtrooper walking around our sunny island soon. woo woo…. ready to rock and roll soon huh!!! what are the big plans?! How about a big suitcase for that? woooo. full set alrdy eh? Congratulations on the full set. hey, you be full armored Gordon now. ^^ congrats on the full set. will you be going around Singapore in armor now? yes but not by myself. not that brave yet. lol no of course not. i can’t dance to save my life. Kagami!!! XD. I dunno. I figured since everyone else pointed out the awesome Stormtrooper armor. I shall give notice to Miss Kagami lol. Finally, you’ve got full set. Congrats to you man. Cant wait for the videos/pictures whatever. Hope to see Storm trooper adventures soon !! I see that Danny now has proper overseas reinforcements! gonna look for some droids first. many actually. most of the troopers heard of danny as well. ya but i;m afraid i need to look for a photographer who is willing to take pics of us trooping. does anyone has peter parker’s number? lol. just between u and me ok? I hope to see you one day – in that suit. LOL. oh that’s shop is simply toys. it’s a great place if one is into movie related figures and stuffs but can be expensive. i bought my stormtrooper blaster from there.